Getting ready for beach season or heading off on a beach vacation? You can print & bring along this free beach bingo printable for a fun activity for your kids to play in between playing in the water & building some magnificent sand castles. Playing the game is simple – just print the freebie, bring it along to the beach and have your kids point out the items to you as they find them. How many of these items do you think you could find at the beach? 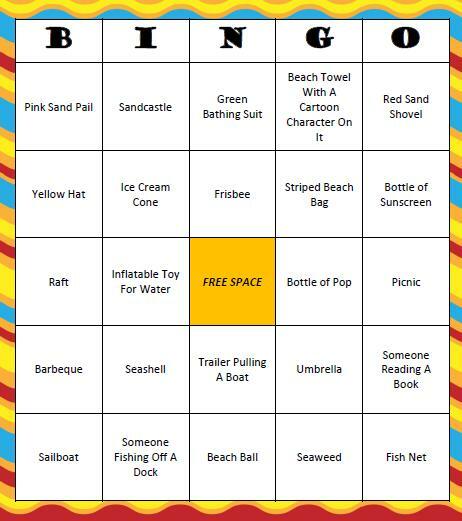 On your drive out to the beach, you could have your kids create their own Beach Bingo game. Simply give them a blank bingo card and have them fill in each of the squares for items to search for at the beach. It’s a great way to keep them entertained during the road trip. For more freebie to enjoy with your family, visit our free Printable Games page. We have more BINGO games, scavenger hunts, charades, word searches, trivia and more. There is something here for all ages and interests. Have you joined our communities yet on Facebook, Twitter, Pinterest or our new RSS feed Bloglovin’? We’d love to have you join our rapidly growing community. Stop by, share your thoughts, ask questions – we’re all here to help each other think of fun activity ideas to enjoy as a family. We welcome your comments and feedback.